Grille Guard Savings from Steelcraft at CARiD! - Ford F150 Forums - Ford F-Series Truck Community. Your truck's front end is the face of your vehicle. When it comes to protection, it requires only the best and Steelcraft Grille Guard is a perfect solution. It is a one-piece solid tube grille guard with frame mounted upper brackets for maximum support. Protective rubber stripping prevents damage of your vehicle. Pre-drilled holes in the grille guard allow allow the installation of auxiliary lights. Steelcraft Grille Guards are available in black powder coated or stainless steel finishes and feature easy, no-drill installation. Make sure your investment is protected with Steelcraft Grille Guard! 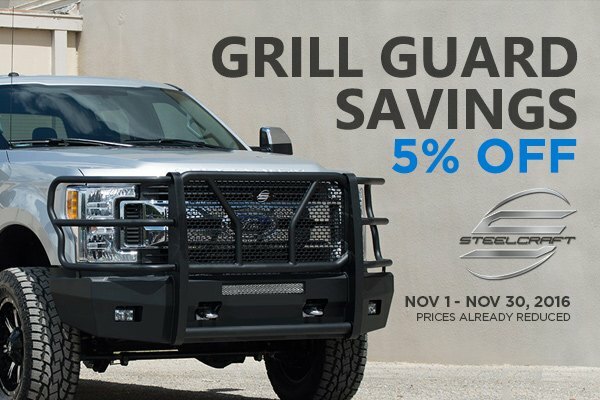 Purchase any Steelcraft Grille Guard and save 5% OFF original price. This great offer is valid through November 30, 2016. Prices are already reduced. Leave your comments and inquiries below. Quick Reply: Grille Guard Savings from Steelcraft at CARiD!